Review Summary: A highly entertaining offering that leaves something to be desired. The ‘90s were a weird and magical era for metal, sort of a David versus Goliath, where David was the equivalent of all those underground, at the time, extreme metal acts and Goliath represented the bigger, more established bands. The troubled youth couldn’t connect with traditional metal anymore, so some of them naturally turned to grunge while others sought refuge in black, death, doom, gothic, power, and progressive metal. Especially, the mid-‘90s is arguably the golden era of power metal with numerous quality releases. However, what was missing from power metal, with the exception of few bands, was a return to more traditional forms and subjects. Therefore, when in 1997 HammerFall released Glory to the Brave and Rhapsody Legendary Tales, both were received extremely positively by critics and fans alike. The scene needed both albums which had a strong epic flavor and also acted as an introduction for fans to more traditional bands. To this day, whether those LPs were a product of their time or their adulation is well-deserved remains an interesting topic of discussion. However, while HammerFall lost steam with time, the Italians have remained one of symphonic metal’s premier acts, despite the constant disputes and lineup changes that bring to mind the word “parody” rather than “rhapsody”. Therefore, their latest effort might be their 12th overall, but it’s the first one, containing new music, with current vocalist Giacomo Voli and without longtime drummer Alex Holzwarth who had joined the band on 2000’s Dawn of Victory. 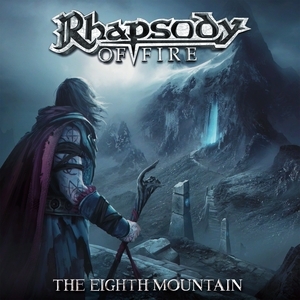 As a result, The Eighth Mountain can be considered a new beginning for Rhapsody of Fire and as such, marks the start of a new saga of albums, entitled The Nephilim's Empire Saga. According to the great Christopher Lee’s narration at the end of the album, the saga tells the story of the Nephilim Empire which ruled the earth but, at some point, fell from grace. However, the empire persevered and when the opportunity arose, it reappeared and erased every trace of human DNA, only to be struck with vengeance by humans. In terms of instrumentation, RoF have remained within their comfort zone while slightly differentiating from their previous full-length. To be more specific, The Eighth Mountain is more symphonic than Into The Legend, as Alex Staropoli’s keyboards play an increased role and the band utilizes more the symphonic elements provided by the Bulgarian National Symphony Orchestra in Sofia. As a result, the Italians’ latest LP is more cinematic and bombastic than a few of its predecessors. Moreover, despite the increased participation of the orchestra, there are guitar-driven songs like “Master of Peace” and others that include some nice neoclassical solos such as “Clash of Times”. Of course, Rhapsody’s music is based on a European power platform, so it is definitely uptempo with a lot of fast drumming. Nevertheless, there is sufficient variety with slower songs like the baroque “Warrior Heart” and, like any good Rhapsody album the respects itself, a ballad is also included in the form of “The Wind, the Rain and the Moon”. Furthermore, what makes the combination of European power metal and classical so successful, is that Alex Staropoli writes music with the knowledge that classical elements will be used within the songs rather than adding classical elements after a metal song is composed. This is apparent in each track but even more in the two epics of the album, “March Against the Tyrant“ and “Tales of a Hero's Fate”. On the former, the classical elements are used as a climax and are immediately followed by some guitar melodies. Speaking of melody, this is definitely one of the album’s selling points along with the strong epic atmosphere and the great choruses which are successfully integrated into each song. Nevertheless and despite those strong points, I found it odd that after several listens, the album didn’t leave me with much to remember; something that, maybe, signifies that The Eighth Mountain doesn’t drift away or differentiate itself from the standards of the genre. Nevertheless, that doesn’t take away much from the album which fans of Rhapsody are bound to enjoy, despite Fabio Lione’s non-participation. In fact, new vocalist Giacomo Voli performs admirably showing nice range and timbre. Actually, the only thing one can really hold against him is that he’s not Fabio, which we have used to fronting this band. Taking under consideration that this is the first saga not penned by Luca Turilli, the drama of lineup changes and that Rhapsody has become Staropoli’s vessel, The Eighth Mountain is a small triumph. It definitely has its flaws – memorability being the biggest one, especially considering the genre – but is a very entertaining listen which is more or less what we’ve come to expect from these guys. The review turned out longer than I wished but I hope you enjoy. This is better than I hoped. Never bothered to jam Legendary Years so this was my first interaction with Voli but he's really good. great album, the band did an excellent job with this one! Only ever heard one of their albums a long time ago and don't remember it well. Might revisit! This was nicely written, liked the little background to contextualize things. Only thing I saw was: "In fact, new vocalist Giacomo Voli performs admirably showing nice range and timbre and the only thing one can really hold against him is that he’s not Fabio which we have used to fronting this band." Frozen Tears and From Chaos is honestly some of their best latter-period work but I'll most likely be giving this a try at some point soon. Good review. Appreciate the kind words, guys. Yeah this is a bit bloated at some points but maybe not so much for the genre's standards. Album is quite enjoyable, I dig its softness vibe. Lately, I find myself, for some reason, looking more and more for good melodies and this one falls under that. Really? Gonna give it a shot then. Haven't checked any of their albums. Great review Manos, not sure if I will check this out though. Someone who has given a 1 to the last like twenty album's they have rated..
To me this is one of Rhapsody's most consistently great albums. Thanks Voi, yeah don't see this one being your cup of coffee. Do you dig the band's earlier material?